Two Ole Miss Rebel athletes have been honored this week by the Southeastern Conference. 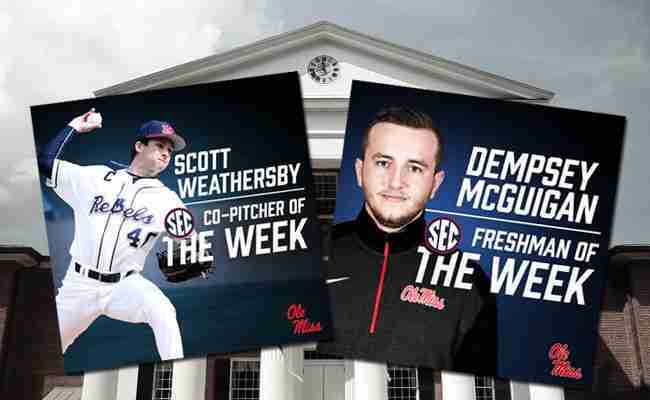 On Monday Scott Weathersby was honored as SEC Baseball Co-Pitcher of the Week, while Dempsey McGuigan was honored Tuesday as the SEC Men’s Track and Field Freshman of the Week. In a 16-inning win over Vanderbilt, Weathersby pitched a career-high six innings of relief, striking out a career-high 10 batters. He retired 18 of the 21 batters he faced, giving up just two hits and issuing one walk. Weathersby pitched out of a bases-loaded jam with nobody out in the bottom of the 11th inning to keep the Rebels alive. He struck out the final two batters of the game to cap off the come-from-behind victory. So far this season, Weathersby has held opponents to a .150 batting average in 11 appearances. He holds a 2.11 ERA with two saves, 35 strikeouts and just six walks over 29.1 innings. After a phenomenal performance in the hammer throw at the Border Clash between Mississippi and Alabama schools last week, Dempsey McGuigan was named SEC Men’s Track Freshman of the Week. Dempsey is a redshirt-freshman and was competing in just his second college outdoor meet. He took first place in the hammer throw with a toss of 210-1, a mark that is better than all but one thrower in Ole Miss school history (teammate Nathan Loe). The previous week McGuigan recorded a throw of 212-7 at the Tiger Track Classic. He currently ranks 14th in the NCAA and second-best among freshmen–and is also fourth among all SEC hammer throwers. Congratulations to Scott and Dempsey for receiving these conference honors! Hotty Toddy!